The Walking Dead Episode 9.5 'What Comes After' review and recap – AiPT! We review Rick Grimes’ alleged last episode. Here we are, ladies and gentlemen. Rick Grimes’ alleged last episode. You’d think the focus would be solely on him, but you would be wrong. Beware all who enter here, for there are subplots. …and we’re taking care of that stuff first. Maggie shows up to Alexandria ready to exact her righteous revenge on Negan. When Michonne tries to block her, Maggie points out that if Negan had killed Rick, she’d do the same thing. Michonne takes a moment to consider this, then actually hands Maggie the keys to Negan’s cell! This part had me ecstatic. After a bit of back-and-forth in yet another redneck Hanibal Lector scene, Maggie was going to finally have her revenge…but alas, it was not to be. Negan first tried to bait Maggie in the most obviously stupid/cruel way possible. After gleefully recounting how he killed Glenn (and how much he enjoyed it), he immediately followed up by begging to be killed. As if that wasn’t bad enough, he quickly spiraled down into crying and saying he wanted to die so he could be with his wife again. Maggie says some stupid cliche line about how Negan being in this state is worse than death, then leaves. There’s another thing with Jadis/Anne and the helicopter, but we’ll save that for the end (you’ll understand why when you see it). The show opens with Rick looking out a hospital window in what is clearly a psychedelic flashback to Atlanta during the pre-zombie days. He then sees his pre-Walking Dead self tell him to wake up. Back in the present, Rick is still impaled on a piece of rebar and surrounded by zombies. His a-----e horse, meanwhile, is still standing off to the side, clearly not afraid of zombies anymore and enjoying his front row seat to Rick’s funeral. Rick uses his belt to pull himself off the rebar (gross) and mounts A-----e Horse, who trots casually along at a speed that allows the walkers to remain close behind. Eventually, Rick comes across an abandoned shack and decides to chill there for a bit. He passes out and has another vision, this time of him and Shane before the accident that put him into the hospital. Shane brings up that Judith is probably his and takes credit for helping Rick become more ruthless. 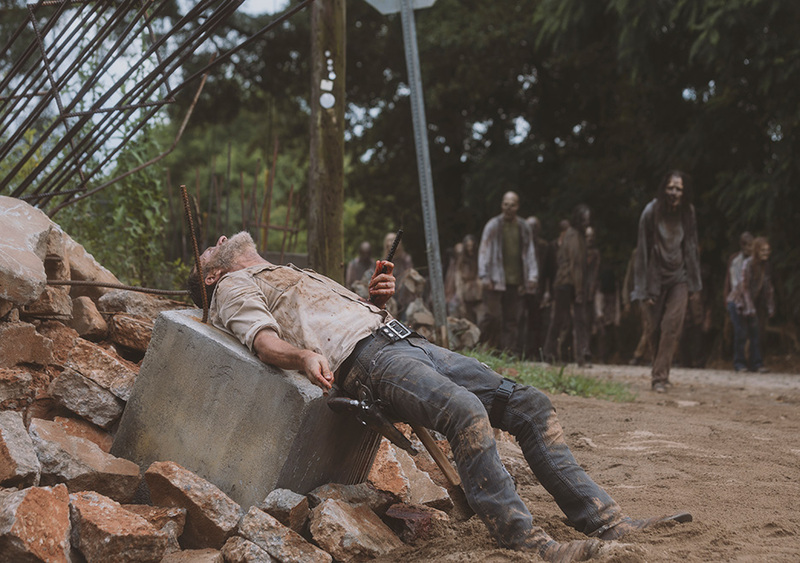 Back in the present, Rick wakes up to find himself surrounded by walkers again. Despite a gaping hole in his stomach and what must have been a massive amount of blood loss, he manages to fight off the zombies while scoring a slew of headshots with his pistol. Once again, A-----e Horse is calmly waiting for him, not spooked one bit by the horde of walkers converging on their location. The horse also continues to trot at an unbelievably slow rate of speed, allowing Rick to have two more dream sequences. In the first, he sees Hershel and tries to apologize for all the terrible things that have happened to Maggie. Hershel assures him that Maggie is all types of strong and will be fine. Later, he wakes up in a giant pile of dead bodies, which is where I assume AMC keeps all the showrunners for The Walking Dead after it fires them. Sasha rises up and tells Rick that he’s awesome and that everything will be okay. When Rick wakes up from this dream, he discovers that A-----e Horse has somehow led him to the bridge everyone’s been working on the last few episodes. He has yet another dream of all his currently living family/friends coming to the rescue. Dream Michonne tells him he needs to wake up, which he does to find that the walkers are still converging on his location…and his current family/friends are rushing to his rescue. Before they can save him, however, Rick decides there’s no way they can fight off such a large horde. The bridge, which was supposed to be structurally unsound, holds just fine. Rick’s final option to keep his loved ones from an unwinnable battle is to shoot some dynamite that was randomly left out, which he OF COURSE hits with pinpoint accuracy. The bridge blows up. Burning walkers fall into the river. Everyone cries. Remember how Jadis was trying to meet up with the people who flew the helicopter but didn’t have a Type A or Type B person (whatever that means) to give them? Well, despite massive blood loss, and a mortal wound, and being on a bridge that JUST BLEW UP, Rick not only survived but conveniently washed ashore right next to Jadis. She tells the chopper people to land, gets Rick in the helicopter, and assures him that he’s going to be okay. I wish I was making that last part up, but I’m not. Flashforward to a few years later. Despite surviving the zombie apocalypse for at least a decade, a group of idiots has managed to get themselves surrounded by walkers in an open field. Right before Darwinism can do its work, though, the zombies are all taken out with perfect headshots from a shooter in the trees. When the group goes to see who their savior is, they find one slightly grown-up Little Asskicker, aka Judith Grimes. Okay, that last part was pretty cool. The rest of the episode…not so much. While the scene between Negan and Maggie was wonderfully acted, the result was stupid. If you really want to believe that Negan was truly as broken as he made it seem, then you have to believe he wouldn’t be so stupid as to beg for Maggie to kill him as he did. The man already had her ready to do the deed without tipping his hand. As far as Rick’s final episode, let’s leave aside the fact that AMC is going to bleed the character dry with a series of made-for-television Rick Grimes movies…or how absurdly contrived it was for him to wash up right next to where Jadis was meeting the helicopter…or how it would be impossible for him to survive his injuries. Of all the people to come visit him in a series of visions, are you really going to tell me that Lori and Carl wouldn’t be there? Yeah, maybe it wasn’t possible because of budgetary reasons, but having Sasha show up to give him a pep talk felt completely random (despite how much better of a character she was than Rick’s deceased wife and child). And back to the random part…how the hell did that horse know to go to the bridge. And wasn’t the bridge supposed to be unable to support the weight of a zombie horde? As if all that weren’t bad enough, we get a magical dumpster in the form of a helicopter to carry Rick off, effectively prolonging a story that should have ended a few seasons ago. Yes, Andrew Lincoln had a fantastic individual performance, but it was once again overshadowed by a poor script and painfully contrived death cheat. Maybe there are some of you out there who are excited about the Rick Grimes movies, but I certainly won’t be watching them. (Note to my editors: Please don’t make me watch the Rick Grimes movies). Rick Grimes may not be dead, but this episode proved that his story definitely should be. The scene between Maggie and Negan (and Maggie and Michonne) was wonderfully acted. Fantastic individual performance from Andrew Lincoln. The episode's coda with Judith was pretty cool. Once again, another death fake out, this one even worse/more contrived than Glenn's Dumpster Revival. I may hate Lori and Carl, but you'd think they would show up in Rick's clip show visions somewhere. Enough contrived plot conveniences to make your head spin.